As Tonic Syrups become more and more part of everyday gin and tonic culture, we’re starting to see established brands expand their offerings. 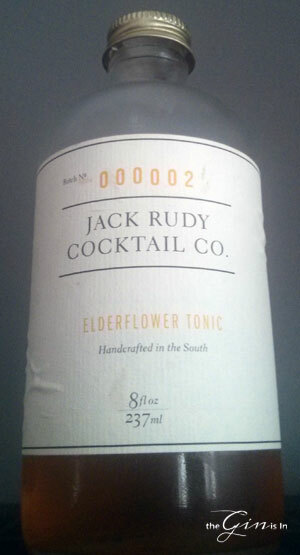 Jack Rudy Cocktail Co. who is among the earlier names in this area recently put out an Elderflower Tonic. Though amber/gold in hue (vivid, and quite beautiful by the way), it’s not simply elderflower; it’s elderflower and quinine. The label isn’t coy about the bottle’s contents: quinine concentrate, water, citric acid, sugar, lemongrass, orange peel, and elderflower. So we pretty know what’s in here. How does this sparse, curated list of ingredients work though? On its own hints of rainbow sherbet, musky elderflower and a vegetal, slightly herbaceous low note. It smells ripe, but quite inviting as well. As if a bee drawn to a flower, we go in further. The palate is somewhat sweetened at first, with elderflower immediately present, lime and orange peel notes leading into a quite tart, sour mid-late palate. A dash of cinchona comes in late, adding some nicely needed bitterness. The finish is floral and deep, with intimations of lily and hyacinth. I liked the way it mixed with gin and tonic as well. The bottle recommends .75 oz of syrup, 2 oz. of gin, and 5 oz of soda. I think that it’s a little faint at this ratio, something a little closer to 4:1 soda to syrup showcases it a little better. That being said, I did actually find that some louder gins, especially flavored gins could overpower the syrup; however, in some cases to nice effect. The elderflower note was more of an afterthought or nuance, perhaps of the gin, than a dominating characteristic. I found it to not add as much to floral contemporary gins. Where I thought it worked best was adding a floral tinge to coriander forward/spice forward gins, or in particular with classic style gins. Among my favorites were the way it shone with Gordon’s and Seagram’s, though again in the lower ratio. Rating: Quite nice. Bright elderflower/citrus flavor profile, with a gently amped up bitterness on the finish that makes for a delightful gin and tonic. I liked it best with Classic style gins, but fans of Elderflower will likely find it a worthy addition to any gin. I suggest dialing back the ratio of soda to syrup a touch, but that doesn’t take away from the product as a whole. Good stuff, check it out.